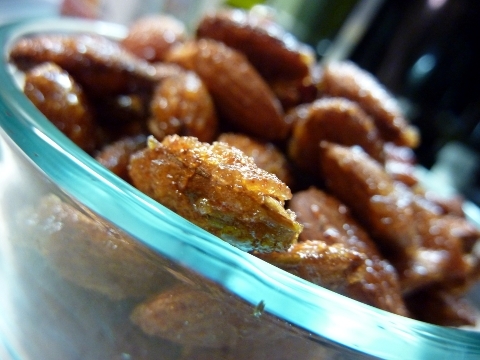 This past weekend, I declared that I was craving some Smokehouse Almonds. This weekend I was also randomly surfing around Foodzie.com, after seeing other Foodbuzz bloggers post about the site. On this site, while perusing the “Snacks” category (“Nuts, popcorn, and more,” in an attempt to fulfill my almond craving), I came across an almond business called My Husband’s Nuts, which naturally elicited a chuckle from me, and I showed them to Tom (we’re clearly very mature). Actually, in all seriousness, the nuts sold by My Husband’s Nuts look very tasty – Butter Toffee, Smoke Flavor…mmm. On Monday, when I arrived home from work, guess what I was greeted with:… My husband’s nuts. Yup. 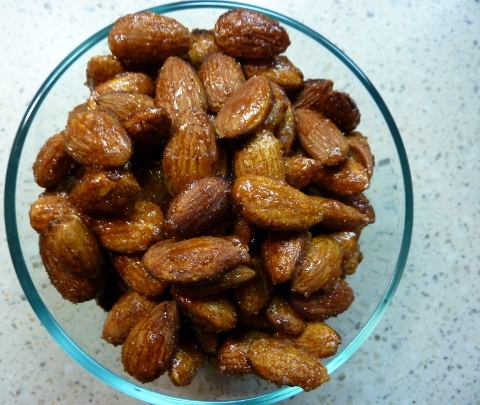 As a surprise, Tom made his very own batch of seasoned almonds for me, warm out of the oven as I walked in the door. 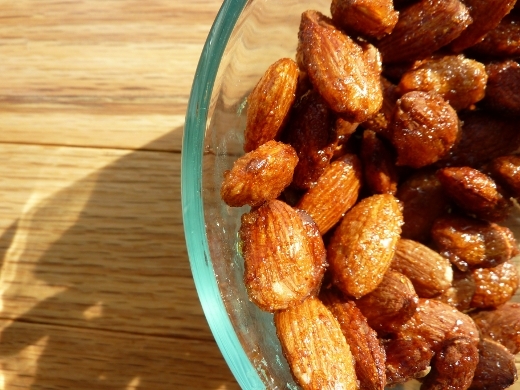 The husband’s nuts almonds were prepared using this recipe he found for Sweet & Spicy Almonds. At first they are sweet! And then BAM…they are hot!…thanks to a healthy dose of cayenne pepper. These are a tasty snack for sure! I’ll spare you from the slew of jokes I heard all evening week about these nuts. ♪♫ Currently listening to: True Romance – She Wants Revenge. If you enjoyed your husband’s nuts, you’ll LOVE my buffalo’s chips! Recently ran across your post. So glad you enjoyed the site. I would love for you to send your reciepe to me as we will post it on our website and send you a free gift!